(Host) A former provost and law school dean at the University of Minnesota has been appointed the 26th president of the University of Vermont. 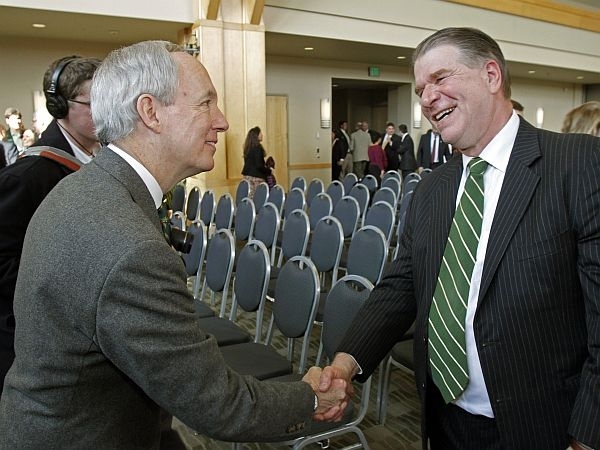 UVM’s Board of Trustees says it chose Thomas Sullivan to succeed President Dan Fogel because his background and experience are compatible with Vermont’s flagship institution. But as VPR’s Kirk Carapezza reports, Sullivan will have a tough assignment when he takes the helm in July. 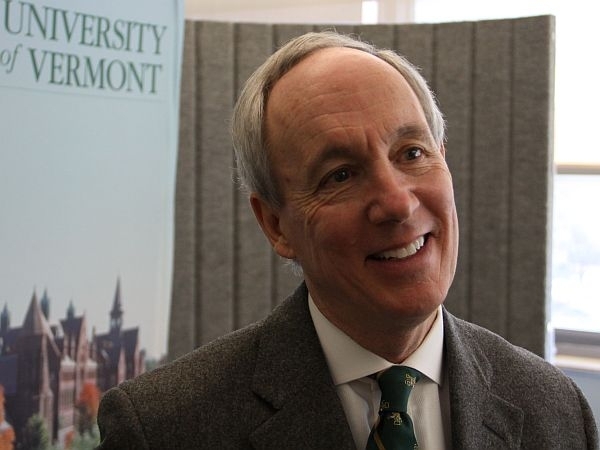 (Carapezza) When asked why he wanted to become the next president of UVM and why he wanted to leave a large university for a much smaller one, Thomas Sullivan doesn’t hesitate. (Sullivan) "I think the University of Vermont is a very unique institution. As I look at its scope and its size and its values and its aspirations, they fit and align so well with my own experiences." (Carapezza) Sullivan has Vermont ties. His wife is a UVM grad. And the law professor has paid his dues in academia, most recently spending seven and a half years as the University of Minnesota’s Senior Vice President and Provost. Before that, he served as dean of its law school. (Cioffi) "Today we celebrate and welcome a man who has been a proud Gopher and is about to be a proud Catamount." (Carapezza) Rob Cioffi is chairman of UVM’s Board of Trustees. (Cioffi) "And thankfully soon to be the former chair of the Presidential Search Committee." (Carapezza) At a campus event introducing Sullivan to the UVM community, Cioffi said the trustees selected him from five talented finalists. (Cioffi) "He is not only a clear thinker, but one who puts his thoughts into action. He is not only a prolific legal scholar possessing a powerful intellect, but he’s an approachable, humble and common sense person as well." (Carapezza) Sullivan introduced himself to the university by committing to working closely with Vermont’s political and business leaders. (Sullivan) "I will champion at every opportunity the principles and the values that underlie the rich history of land grant universities and particularly the mission of this university." (Carapezza) Sullivan pledged to make UVM more affordable, to enrich its curriculum and to compete for research funding. Governor Peter Shumlin welcomed those priorities. (Shumlin) "This great university determines Vermont‘s future. It determines the future of our graduates. It determines our cultural, intellectual and jobs future. And that is why this selection today is so critical." (Carapezza) After the ceremony, former president Dan Fogel, who resigned in August amid personal controversy, congratulated Sullivan as cameras clicked. (Fogel) "This is a legacy in great hands, and I know you will build it higher and better." (Carapezza) Faculty members have criticized Fogel for raising tuition and increasing enrollment. They say those were easy ways to raise revenue and they call it low hanging fruit because UVM is still facing a projected five-year $120 million shortfall. Fogel didn’t have any specific advice for the new president for closing that gap. (Fogel) "I think there are probably other fruit that ripens with time as the university matures and its programs mature." (Carapezza) And Thomas Sullivan hopes that new fruit ripens quickly, as many public universities are increasingly dependent on federal funds. He begins his new job July 15th.